This design uses junk box 2N2222A or 2n3904 transistors. Its easy to build and offers excellent performance. Here is a preliminary schematic. It works well but I am still tweaking it. Look for revisions to follow. It only uses bipolar transistors, and the antenna signal can be injected such that it is isolated from the tank or directly to the tank through a small cap. 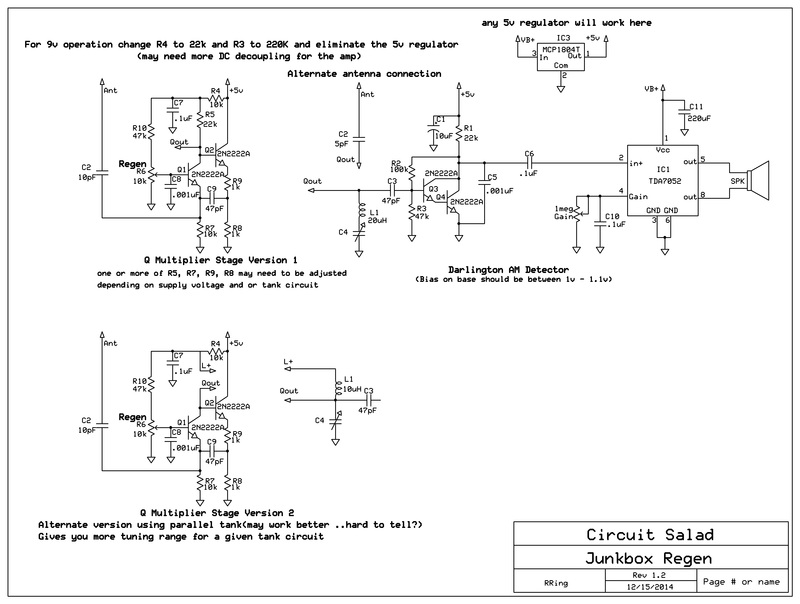 The circuit can use a series resonant Clapp type topology or parallel tank. The clapp version reduces the effect of parasitics and provides very stable tuning. It also works really well with varactor tuning as the voltage swing across the varactor is low. The series tank requires larger inductors for a given frequency then a traditional parallel tank. I am using 20uH(two crappy tiny molded inductors) and a 300pf variable to get in the 5-8Mhz range. You don’t need any tapped coils or tickler…etc – just about any inductor should work. The parallel tank version gives more tuning range for a given tank circuit. It may be a better topology..its hard to tell. You get more tuning range for small tuning caps and the the inductor will be smaller. You also eliminate the collector resistor which surely adds phase noise to the clapp version, when oscillating. Depending on the tank coil you use and/or if you use a different supply voltage, you may need or want to adjust some of the resistor values. These are noted on the schematic. On the bright side, I have use wide range of values for most of these components and the circuit has still worked. It’s all about maximizing gain while still maintaining smooth regeneration. The darlington detector is a bipolar version of a “plate detector” where the the darlington is biased just at cusp of being turned on. It acts like a halfwave detector but with high Z and significant gain. You could use a FET but I thought it would be fun to only use junk-box type transistors. I am using 100k and 47k biasing resistors for the detector. The ratio is what matters so 1meg and 470k will work fine also. In the schematic, I show the detector connected to L1 and C4 which make up the tank circuit for tuning. I also show a Q multiplier circuit separately which connects via the “QOut” signal to the tank circuit also. Its just another way to conceptualize a regenerative radio. The transition from oscillation is very smooth. Sensitivity is excellent. The circuit is simple. I believe the schematic is only correct for the tda7052a or 7052b. This arrangement will not work for standard tda7052 devices which a number of suppliers sell. I don’t have so much experience with this particular topology, but I would be concerned about the Q2 base loading down the tank (low RF input impedance) and the Q2 parasitic capacitances (which will vary with signal strength) causing noise. B. Kanika connects the Q multiplier to a tap on the coil to mitigate this problem (see http://www.b-kainka.de/bastel3.htm). Also see here for some discussion of the problem: https://groups.yahoo.com/neo/groups/regenrx/conversations/messages/5324 . Regarding “Its a common base topology … and the Z is very high and well matched”: yes, Q1 is common-base, with high output Z at the collector. But Q2 – which, in the parallel tank version, is connected directly to the hot end of the tank via the Q2 base – is common-collector, is it not? I still get the feeling that the Q2 base (due to the large junction capacitances) will not have a very high input Z (at the base) at the RF frequencies at which this receiver is operating, which could lead to more tank damping than if Q1 were used by itself as a common-base Q multiplier (with feedback from an inductive or capacitive tank tap back into the emitter). If I get some time I may try to run some LTspice simulations on your AC-coupled differential pair Q multiplier, to test the bandwidth at critical threshold and to see if Q2 is introducing additional damping or not. Of course, you mentioned you are using low-Q inductors to start with, so it may be that the original inductor Q, and not the active devices’ input Zs, is currently the limiting factor. Incidentally, I started a Yahoo Group on simulation of regenerative receivers (https://groups.yahoo.com/neo/groups/regenrx-simulations/info), where a small group of like-minded individuals discusses analysis and optimisation of various regenerative receiver topologies. You are welcome to join if it interests you. 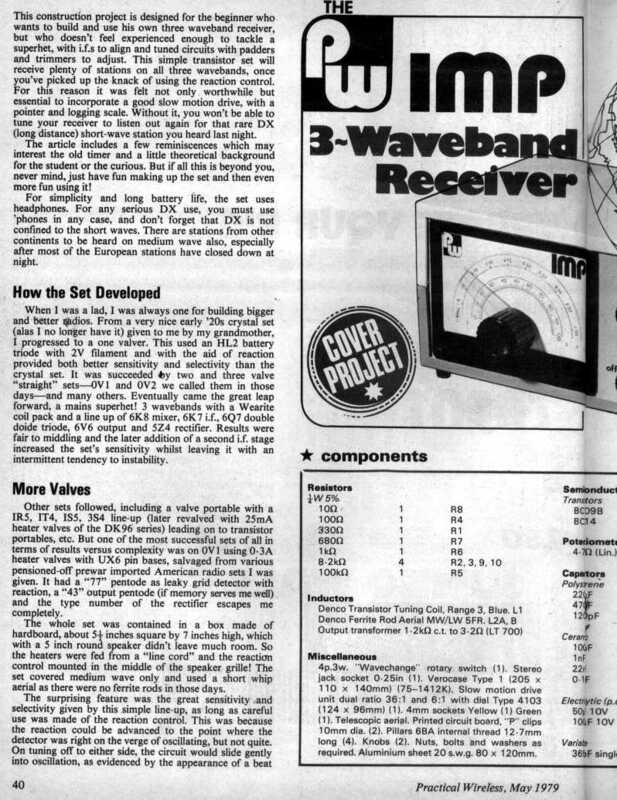 Finally, you may find the following article of interest, if you have not already seen it: http://www.vintageradio.me.uk/radconnav/transtrf/imp0579pw%5Cpage1.jpg (note the article goes from page1 through page7).That article shows a regenerative receiver using an AC-coupled BJT differential pair for the oscillator, with separate DC bias for each transistor, similar to your design. VK2ZAY also describes a similar topology (and the problems caused by tight resonator coupling) here: http://www.vk2zay.net/article/128 . The loading is not the same either. The feedback transistor can be considered an independent stage and analyzed as such. In mine, the DC biasing is independent and the feedback level is much lower. If you put the noisy regen on the scope and compare to my circuit- it does not produce as nice a sine wave output. That is one reason I show the output of the oscillator as it breaks into oscillation. It looks pretty good and the transition is very smooth. An addition to my last comment about simulating in LTspice the damping effects of Q2: I mentioned comparing a Q1+Q2 circuit to a circuit with Q1 only. A better test would be to compare 2 configurations of the Q1+Q2 circuit: configuration A would be as you have it configured (parallel tank version), and configuration B would be with the Q2 base connected to a tap (or link winding) on the L1 coil. My expectation would be that configuration B would show lower tank loading and narrower bandwidth. This should be pretty easy to test by configuring the circuit to be below critical threshold for some arbitrary setting of R6, then running an AC sweep to check the loaded tank bandwidth for both configurations A and B.
I did a quick open-loop analysis in LTspice of your parallel-tank Q multiplier. I broke the feedback loop at C9, drove the common-base Q1 emitter input with a voltage source, and measured the common-collector Q2 emitter output at C9. I measured the half-power bandwidth for 2 cases: case A is with the Q2 base connected directly to the hot end of the tank inductor; case B is with the Q2 base connected to a low-impedance tap on the tank inductor. The regeneration control pot was set at mid-value (5k/5k divider), which was confirmed with a transient analysis to be below the oscillation threshold. You can see in the AC sweeps that the half-power bandwidth for case B is narrower (each horizontal tick is 2 kHz), indicating reduced tank loading thanks to the low-impedance tap for the Q2 base. This observed bandwidth difference is with the regeneration control set rather low at 5k/5k. As the regeneration is cranked higher, the difference in bandwidth between the two cases will be Q-multiplied. If you want to experiment with my LTspice files, I can make them available. hey thanks for the effort.. I like to think about this stuff and appreciate the discussion. I will try and reproduce you simulation for fun. I figured Q2 would not load very much because of the large emitter resistor and that the junction capacitance would be absorbed in the tank C. Practically speaking, I can achieve loss of fidelity from side bad attenuation as the Q gets very high. Usually this indicates to me its “good enough” . Perhaps coupling through a very small cap and independent biasing Q2 instead of the direct coupling will improve the loading without requiring a tapped coil…which I really want to avoid. Anyway I will keep tweaking and do some simulations to explore your suggestions. I also think that your suggestion of independent biasing of Q2 and using a small capacitor (or maybe a capacitive voltage divider on the tank) to connect Q2 to the tank might reduce the tank loading. It will be interesting to see what you come up with. I’ve built the “noisy regen” once (using the simple DC emitter-to-emitter coupling) with only marginal results, but I’ve been meaning to experiment more with this differential pair circuit. 1. Do you think you can take the audio directly off of the Q-multiplier in your circuit, or is the Darlington detector necessary? 2. Does the circuit still oscillate at upper HF, say 20 MHz or above? What do you think of its performance in that region? Can you receive SSB at upper HF, or does the detector frequency pull too much? Thanks for any feedback. Like you, I also enjoy thinking about and tweaking these regen circuits. I used it up to 15 MHz or so and work fine up that high. Yes… the audio can be extracted either off of Q2 or Q1 but then you need to adjust biasing and add a load resistor large enough to provide audio gain vs all the emitter degeneration. All of this was tricky to set up..so a knowledgeable builder can do it. Using the darlington simplified the design so a a novice can get it working. It does provide gain and surprisingly good fidelity so I stuck with it. Of course you can use a FET as a proper “drain detector” but I just wanted to avoid using FETs for the heck of it. After finding your site I decided to build your newest Regen radio and wanted to offer some feedback. The radio I built tunes from about 3.2 to 5.8mHz and will tune an image of a very strong nearby, 2 miles, FM station on 97.9mHz. The radio has a very smooth oscillator waveform, just like what you showed in the video. Thanks for the great web site and interesting radio design. thanks for the info …I think the parallel tank version works a little better(not sure which one you used) and I may make some more tweaks on the design…if you come up with any improvements let me know! I have done a little more tinkering with your Junk Box regen radio design. For what it is worth, and as far as I can tell, the parallel tank version of the radio seems to work about the same no matter what component I swap out, within reason. For example, changing the oscillator bias from 47K to 10K makes no noticeable difference. Changing the tank components only moves the relative position of the variable cap for a given station. In any case, the circuit oscillates very smoothly no matter what I change. Also, I found that the detector stage bias on the two version, series and parallel, both have a .95 voltage at the base of the Darlington versus the 1.0 to 1.1 levels you list on the drawing – used a fluke 9060a to measure – no RF compensation. Changing the voltage divider resistors does not seem to change the bias point of the detector. I am using 2N2222A transistors. I did replace the molded 10uH inductor I have been using with a homebrew 5 inch diameter coil of about 2uH and was able to hear various 49m SW stations, many religious – Radio Havana – an Asian station, without an antenna or ground! As I have more time I will experiment with your radio further and let you know what if anything I find. I really like the simplicity of your design. The ability to hear stations with the homebrew inductor is very interesting to me. I would like to optimize this to receive W1AW using a large inductor – any suggestions? I have some picture of the radio and a movie of the oscillator I can share with you in you are interested. That’s really neat…I wish there was more time in the day! I need to revisit this circuit a little. So with regard to the bias, normally transistors start to turn on with about .5v bias so the darlington will double this roughly to 1v. I need to look at this a little more because the detector depends on cutoff occurring so that half-wave buildup the modulation occurs. My bias point may not be optimum. Thanks for the info. With regard to the tank. Q multipliers multiply the natural Q of the passive tank. So if your baseline Q is high – you will get more selectivity as you get close to oscillation but your overall gain may not improve much. Still selectivity is the name of the game(you can always amplify more) My recommendation is make a honeycomb jig with little posts and use stiff enameled copper wire(or solid jacketed wire) and wrap a old school crystal detector type coil…if your not familiar with this look online. You can get more L with less stray capacitance. This will result in a wide tuning range hi Q coil. You can get god results with pretty large coils…maybe six inches in diameter. Maybe I can build one also and see what I can come up with. Based on another persons comments below…the circuit may need some optimization to preserve all of this benefit of the high performance tank. Post a link to some PICs absolutely! 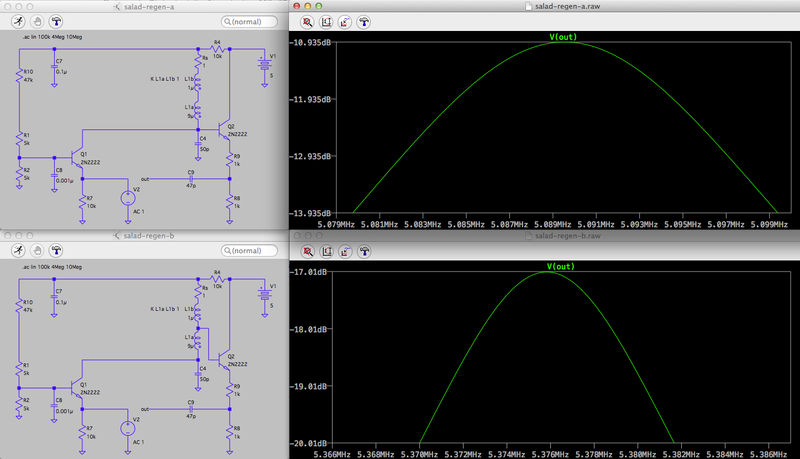 cool …I revisited my bias on the detector and found its a little higher than yours at about 1.05 V but pretty close. I would expect better performance a little closer to cutoff(there is about a 1V drop across Collector) but best performance is at bias I am using. Also I made an adjustment in the circuit which I am going to post which improves performance a little bit. It involves eliminating the direct coupling of the feedback transistor. Does this regen perform better then your other high performance one? and get up and running. This is mainly because BJT characteristics are don’t very much as compared to FETs which can vary quite a bit from device to device. you will get really nice results using a small buffer stage to isolate the antenna and a good quality tank coil….I think the parallel tank variant is the better choice. They should provide supperior performance and I am going to try this. big fan of FET infinite impedance detector. Just wanted to use Darlington to see if it would work. How well does the darlington detector behave at higher shortwave frequencies between 15 MHz and 30 MHz? Assuming that Q3 and Q4 of the darlington pair are BJTs for RF purposes. good question! Performance will likely suffer in the upper regions but it works up to 20Mhz at least.. Such a receiver is impractical much above 15Mhz anyway just because of stability and diminished selectivity. Experimentally, I have made RF oscillators out of Darlington pairs using 2N2222A’s above 20 Mhz reliably. When using a Darlington pair as an AM detector, the collector of the first left transistor should be connected to the supply rail, in stead of connecting it to the collector of the second right transistor. An improvement is also to put a resistor with a value between 10k to 100k between the emitter of the first transistor and ground. Purpose is to discharge the base emitter junction of the second BJT and to allow flowing sufficient current through the first BJT. “Those resistors are to speed turn-off. The base-emitter junction has some capacitance, which is made apparently larger in an inverting amplifier configuration by the Miller effect. To turn the transistor off, this capacitance must be discharged. I think this also true for using darlington pairs as detector on higher shortwave frequencies. Think about the negative half of the RF signal cycle. You can also let the first transistor of a Darlington pair function as an infinite impedance detector, put a capacitor of some nF between the emitter and ground of this transistor and shunt it by a resistor of 100k. Then the second transistor only functions as an AF preamplifier.